It’s easy to recognize and often define beauty. But how do we define ugly? Is there a fine line that walks between it and *unique*? You be the judge. As designers, we’re often looking to beautify the world. What if our thoughts were to drift to the “other side” from time to time? Case in point: I recently attended Northern Voice, a conference for bloggers, writers, entrepreneurs, and creatives involved with social media. 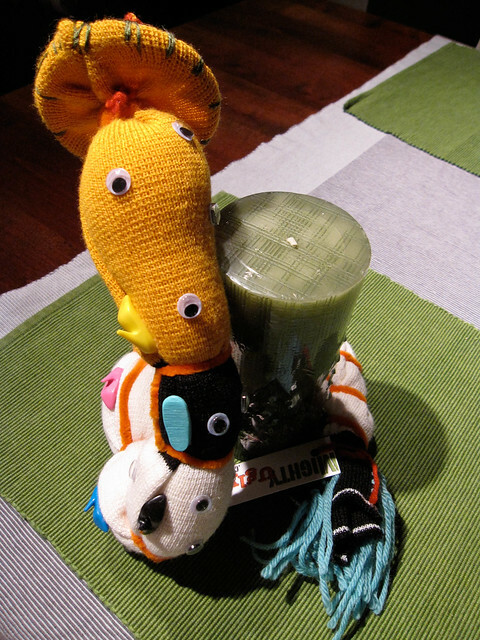 Following a presentation given by Kimli Welsh, several handmade dolls were randomly handed out to the audience. I have to admit that this doll didn’t arrive into my world right away. It was given to someone seated beside me. Luckily, she wasn’t too attached to it (yet!) and gave it to me in a trade for a few items in a goody bag I’d received earlier. First thoughts on what made this doll unique? Its hat, googly-eyes, and assortment of tiny plastic shoes attached to it. Second thought? Why not drape it around my neck; it sure was long enough! 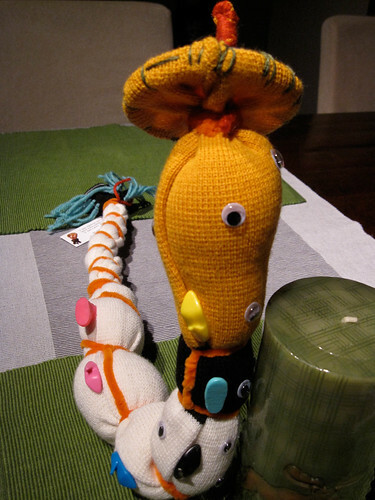 1) Make something very ugly. 2) Take a photo. Share it. 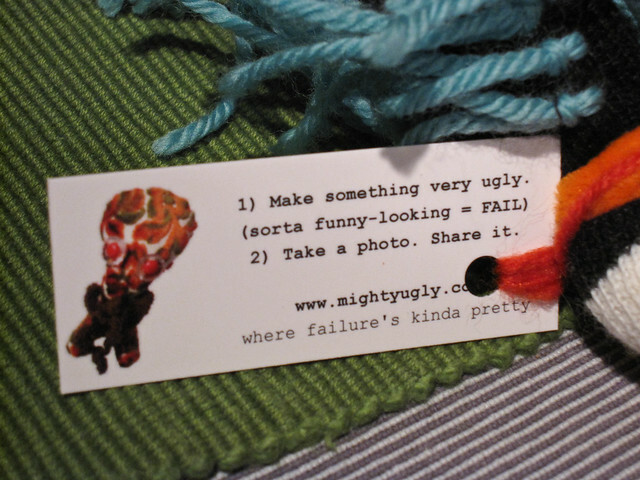 Below those brief directions was a mightyugly.com web link and the tagline “Where failure’s kinda pretty”. I was taken aback. The LAST thing that I would find this doll to be is ugly. Unique is more the word. Now what to do with it once it arrived home (after all, there IS a husband involved here who would no doubt question its existence and where to put it). I had to laugh when he suggested that it would make a great door draft protector! A very practical response to the ugly question. I think it resembles an enormous chili pepper. Thoughts? You are an amazing trader! You trade for everything and anything! I just may go to the Mighty Ugly meet up next month. Also, lucky you – a door draft blocker. Awesome. Aww, thanks, Carol! I hope that the trade went well in the other woman’s favour too. She got some chocolate and a movie pass. I have a door draft blocker that’s right now a guest in our guest room. Next year I plan on attending both days of NV. I would have loved to have attended the crafting session. Did you wind up finding out about the Olympic pin trade in time? Apparently that too was going on during NV. Talk about trading of all kinds! There’s definitely a line when it comes to any art. Craft in particular. In that area to each there own I say.